Lynne Featherstone today sent a final email to residents in Hornsey and Wood Green, thanking them for giving her the opportunity to represent them. Lynne was first elected as a Liberal Democrat councillor in Muswell Hill in 1998, and to the London Assembly in 2000. She overturned a 26,000 Labour majority to become the Liberal Democrat MP for Hornsey and Wood Green in 2005. Over the last 10 years, Lynne has been consistently recognised as one of the most responsive MPs, despite having one of the highest caseloads in the country. She worked with residents to protect local services like the Whittington A&E, and led successful campaigns to secure fairer funding for Haringey’s schools and health services. As a minister over the last five years, Lynne Featherstone was the architect and originator of Equal Marriage, and launched the £35 million campaign to end FGM within a generation. “This will be my last email to you all. And I just wanted to say a heartfelt thank you for our relationship over the last ten years whilst I was your MP. It has been an honour and a privilege to serve – both locally and nationally. I have had the opportunity to help people and to change the world a little bit for the better – the very reason I went into politics in the first place. I know how hard it was for my left leaning constituents – because many of you told me on the doorstep – to decide between keeping me and your genuine fear that if you voted for me that we would get a Conservative government. Ironically we have one anyway. And I know from my right leaning constituents how they feared a Labour government – so voted for me to try and have one less Labour seat. I would ask one last favour of you – to watch Nick Clegg’s resignation speech if you have not seen it already. It says everything I think – much better than I can. Over 7000 people have joined the Liberal Democrats since polling day – and I believe that is because there is a realisation that politics without a liberal voice is the poorer. The Labour candidate in Hornsey and Wood Green has resorted to desperate smears against the Liberal Democrat candidate, Lynne Featherstone – and is now facing possible legal action. At the time the vans went out (July 2013), Lynne Featherstone was in the Department for International Development, kick-starting the campaign to end FGM and fighting to protect the aid budget. Lynne Featherstone was a minister at DFID from September 2012 – November 2014. Labour have been advised to immediately cease delivering the letters, and issue a retraction to all residents who’ve received the letter. Failure to issue the retraction will lead to the matter being reported to the police – which would throw Labour’s campaign in Hornsey and Wood Green into turmoil. “Today, many residents received a letter from the Labour party – which contains false information. “In it they say I was the Home Office minister at the time of the ‘go home’ vans. This is not true. “My team and I are very upset with the lies and the desperate smears, which are being sent out by the local Labour campaign. “Just to be clear – at the time the vans went out (July 2013) I was in the Department for International Development, kick-starting the campaign to end FGM and fighting to protect the aid budget. Had I been in the Home Office at this time – those awful vans would not have happened. “As you know, I have been running a unity campaign here in Haringey, and have always been relentlessly positive about the benefits of immigration. “Contrast this to Labour – sending out leaflets about their ‘tough new approach to immigration’ to the most diverse parts of this constituency, pledging to freeze immigrants out of welfare for 2 years, and that ‘control on immigration’ mug. The Haringey Indepedent asked me to outline reasons why people should vote for me… Here’s my response! “Starting with the very basic – I am local! I grew up in Haringey, went to Highgate primary, and still live in the constituency of Hornsey and Wood Green today. “It’s so important to know the area you want to represent. “I also have a 20 year record of working with residents and campaign groups to protect and improve our local services. “If I had to pick the single most important campaign – it would be saving the Whittington A&E from the previous Labour Government’s closure plans. The second I got wind, I posted the information on my website (where it remains today!) and kicked off a massive campaign. “Joining forces with local residents and campaign groups – I marched, I petitioned, I secured a debate and asked questions in Parliament, and together we were successful and Gordon Brown’s Government backed down. If we hadn’t saved it – I don’t think we’d still have a hospital. “Nationally, I’ve fought for policies that benefit our borough. The Lib Dems in parliament have taken the lowest paid workers out of paying tax, and introduced the Pupil Premium to get extra money to schools in more disadvantaged areas. “These measures mean that thousands of low-paid Haringey workers have be taken out of paying income tax altogether, and £13 million extra has been given to our local schools, teachers and pupils. “In Government, I’ve used my ministerial positions to push a progressive agenda. As Equalities minister, I was the originator and architect of equal marriage. I then moved to the Department for International Development, where I announced a £35 million programme to end FGM within a generation, and protected the aid budget. Election Forecast has put Lynne Featherstone ahead in Hornsey and Wood Green – predicting that she will hold the seat for the Liberal Democrats at the General Election on May 7th. These figures follow a different constituency poll in March, which had the Liberal Democrat candidate just 1% behind her Labour opponent. 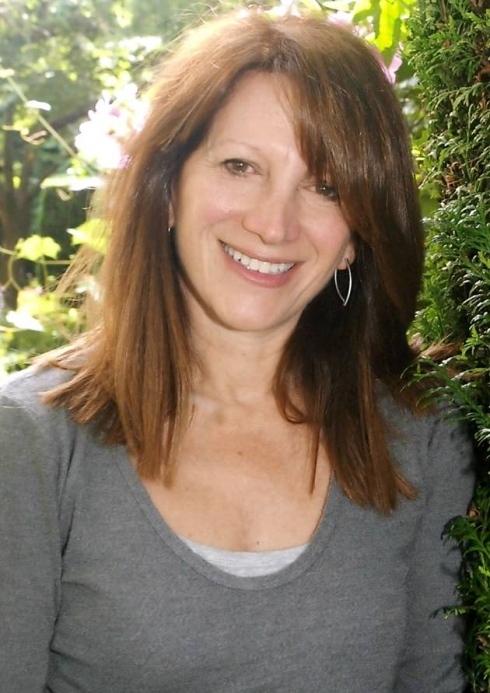 Lynne Featherstone had represented Hornsey and Wood Green for 10 years. In the last five years in Government, she was the architect and originator of Equal Marriage law, and she announced a £35 million global programme to end FGM within a generation. The Election Forecast model combines data provided by YouGov with all publicly released national and constituency polls, historical election results, and data from the UK Census. “The mood on the doorstep is increasingly positive, and it’s clear that the momentum is with us. The latest Election Forecast shows we’ve edged ahead. With just one week to go – my team and I are working flat out to keep Hornsey and Wood Green liberal! 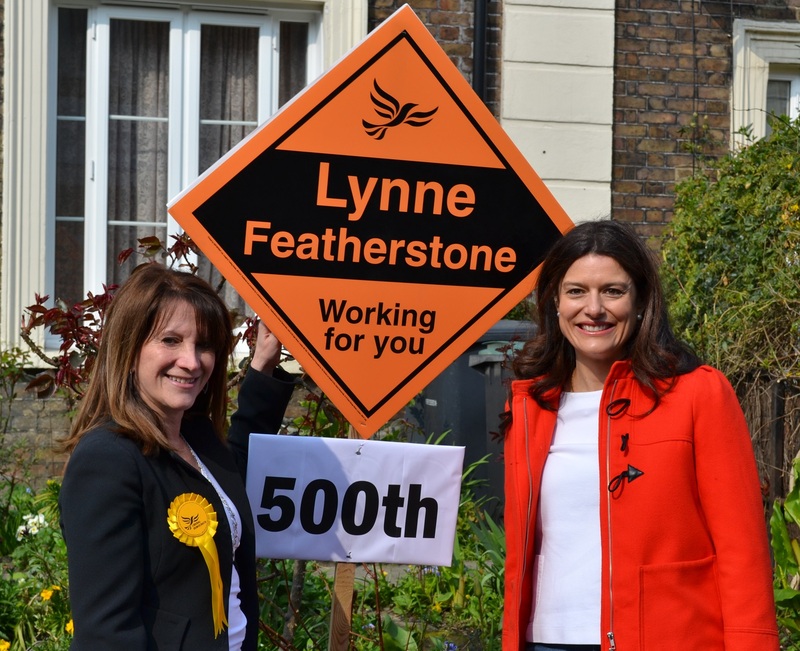 Lynne Featherstone was today joined by Miriam Gonzalez Durantez, to put up the 500th Liberal Democrat stakeboard in Hornsey and Wood Green. Local resident Marylyn Duncan, a resident on Middle Lane in Hornsey, was there to greet Lynne and Miriam, and watch the stakeboard go up in her garden – situated opposite the Hornsey and Wood Green Labour office. Lynne and Miriam then went to Ducketts Common, by Turnpike Lane station, to meet local youth organisation Exposure. Exposure were out filming for a project they’re working on locally. They discussed Lynne’s work in Government to help get young people out of gangs, and to promote self-esteem – particularly for the girls who have been involved in gangs. “It was fantastic to be joined by Miriam on the campaign trail. The 500th board is so important – as it shows just how much support my team and I have locally. With 29 days to go until polling day – milestones like this are incredibly important. 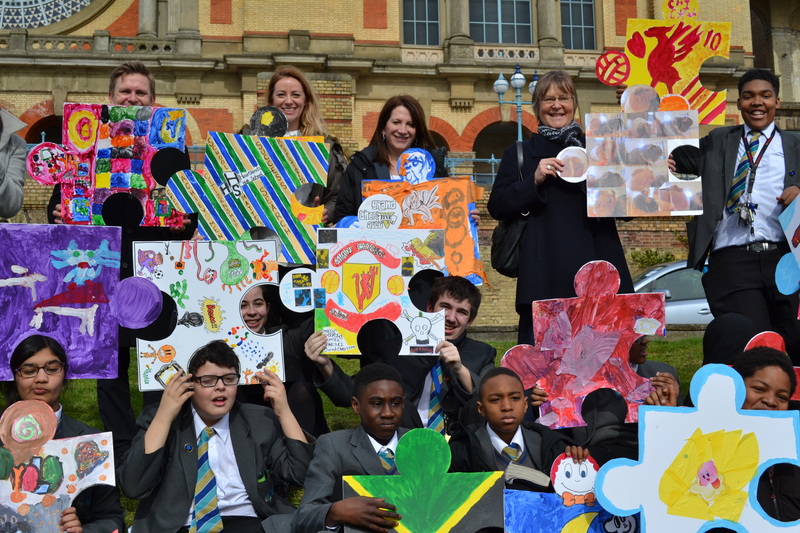 Lynne Featherstone last week joined the Autism Provision team from Heartlands High School, as part of World Autism Awareness Week. The Lib Dem candidate for Hornsey and Wood Green met the students and looked at all the individual pieces of artwork. The school – which specialises in supporting students with autistic spectrum disorder – also held an evening awareness event. “It’s so important to raise awareness of autism – and the many ways it can affect people’s lives. We’re so lucky in Haringey to have a school which specialises in supporting students with autism.